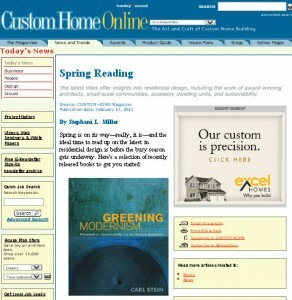 In Greening Modernism: Preservation, Sustainability, and the Modern Movement (W.W. Norton & Co., $60), author and architect Carl Stein argues for the reintegration of modern architecture, architectural preservation, and sustainability as a means of overcoming the resource shortages currently facing the design and building industry. Offering historical perspective on these three issues, Stein draws connections between individual building design decisions and the global energy and environmental crises. Advocating the continued use of existing modern buildings to reduce future demands on finite resources, he also offers guidance for professionals and students on specific building-upgrade projects. Modernism was the defining cultural movement of the 20th century. While its application to the built environment lacked our understanding of resource constraints, its hallmark was, in fact, a precursor of today’s quest for sustainability: realizing maximum value from minimal means tailored to local conditions. Over time, Modernism’s precepts were misapplied or neglected, with damaging results. But its power is undimmed. By applying its integrative, analytic rigor and its focus on solving problems at the deepest level, we can both serve sustainability goals and enrich our quality of life. And we can honor and reclaim the authenticity of place. Opportunities to do this abound. 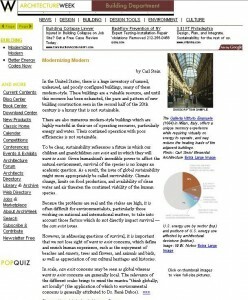 Our existing building stock contains immense stores of “embodied resources,” notably the energy consumed at every step of a building’s creation. We can capitalize on this by adapting buildings now in surplus to meet new demands for space, avoiding the exorbitant environmental costs of demolition and new construction. We can upgrade buildings in active use to high-performance standards. We can sustainably preserve buildings with historic and aesthetic merit, many of them Modernist structures. We can shape urban and regional planning contexts appropriately. To illuminate the magnitude of these potential benefits and how Modernism can guide us toward them, we’re convening a glittering roster of experts. Some are Modernism’s direct heirs: they knew its practitioners and worked with or for them. All of them view it as a living legacy. 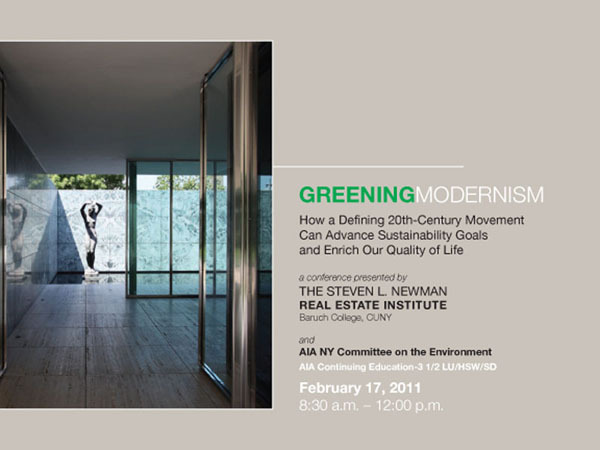 Their provocative discussions will be keyed to release of a major new book: Greening Modernism: Preservation, Sustainability, and the Modern Movement, by Carl Stein, FAIA, who will speak at the event. Carl Stein, FAIA’s Greening Modernism: Preservation, Sustainability and the Modern Movement (W.W. Norton & Company, 11.29.10) offers a compelling and insightful argument for a creative and enthusiastic reexamination of the interconnection between modern architecture, sustainability, historic preservation, and green strategies. One of the many things that sets this book apart from others on architecture and sustainability is the way in which Stein unfolds the theoretical, instructional, and pioneering tenets between design and technology from the pre-petroleum to late-petroleum eras, suggesting opportunities for architecture in a post-petroleum world. 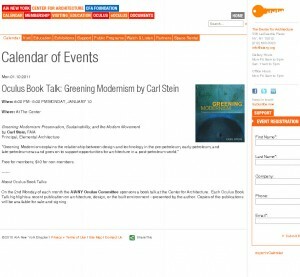 Sightings 01.10.11: Carl Stein, FAIA, kicked off the 2011 Oculus Book Talk series with a lecture on his new work, Greening Modernism: Preservation, Sustainability, and the Modern Movement (W.W. Norton, 2010). 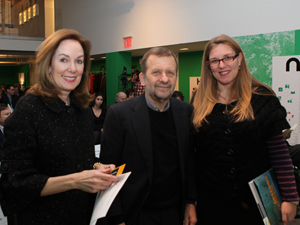 AIANY President Margaret Castillo, AIA, LEED AP, author Carl Stein, FAIA, and AIANY Oculus Committee Chair Kirsten Sibilia, Assoc. AIA, LEED AP. “A sustainable future,” writes Stein, “one in which humankind will have a place in the ecosystem of the Earth, depends on a fundamental reconsideration of how we utilize all of the resources that support the qualities of our lives.” The second greatest end-use energy consumer is infrastructure construction, and there is a dire need to upgrade this part of American society. 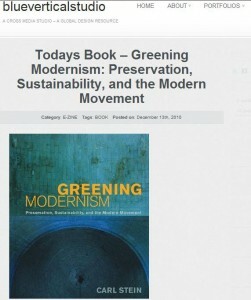 As you read Greening Modernism, you, too, will be reminded that as much as the truth sounds good on paper, the hardest part is to convert these ideas to the politics of choice and economics. While architects have their challenges set out before them, Greening Modernism will be a hearty and generous companion for those who are willing to challenge what they value in themselves and consider to be the nexus of design, quality of life, and a sustainable global future. Note: This was the first of a monthly series of book talks hosted by the AIANY Oculus Committee. Maxinne Rhea Leighton, Assoc. AIA, is a member of the AIANY Oculus Committee. She is a business development, public relations, and marketing professional in NYC and Washington, D.C. Her expanded project base includes cause-related marketing, and the integration of social media with traditional-based forms of communication for non-profit and cultural institutions. 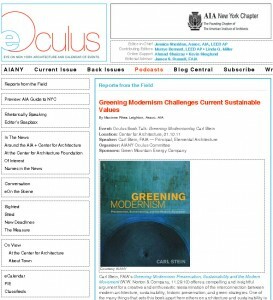 Carl Stein, FAIA, principal of Elemental Architecture, has been selected to deliver the inaugural lecture for the AIA Oculus Book Talk Series on his recent publication ‘Greening Modernism’ at New York City’s Center for Architecture on Monday, January 10th, 2011 at 6:00pm. On the 2nd Monday of each month the AIANY Oculus Committee sponsors a book talk at the Center for Architecture. Each Oculus Book Talk highlights a recent publication on architecture, design, or the built environment –presented by the author. Copies of the publications will be available for sale and signing. 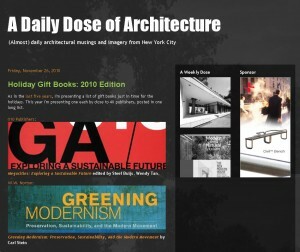 Archidose (Almost) daily architectural musings and imagery from New York City, includes ‘Greening Modernism’ in their list of Holiday Gift Books: 2010 Edition. 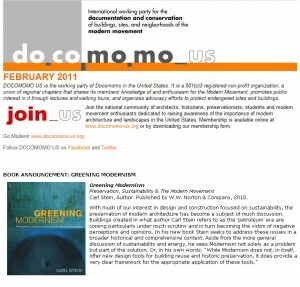 blueverticalstudio, a cross media studio and global design resource, selects ‘Greening Modernism’ as today’s book. BVS is the mind and inspiration of Michael Ammerman. It is a progressive, cross-media studio formed in 1999 to pursue creative ventures which help push and expand forward thinking ideas and mediums. In the United States, there is a huge inventory of unused, underused, and poorly configured buildings, many of them modern-style. These buildings are a valuable resource, and until this resource has been exhausted, the pace and pattern of new building construction seen in the second half of the 20th century is a luxury that is not sustainable.